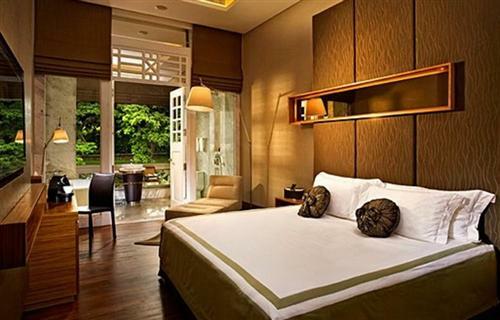 Treat yourself to a weekend getaway at the idyllic Hotel Fort Canning in Singapore. For SGD320 (USD260), enjoy a Deluxe Room, internet access, complimentary evening cocktails, late check-out until 4pm, and a sumptuous Sunday brunch for two people. A 10% service charge and 7% taxes are additional. The “Weekend Treat” promotion is available until December 30, 2012. This promotion is valid for stays on Saturday nights. The package can be upgraded to a Premier Room for SGD360 (USD290) per night. Rates are based on single or double occupancy. Children under the age of 12 can share the room with their parents for no additional charge. The complimentary cocktails are served in the private lounge from 6pm – 8pm. Hotel Fort Canning is housed in a historical building that was once a base for the British Command during World War II. While it retains many original features from its colonial days such as a columned façade, it has been restored into a luxury hotel with two swimming pools, high-tech fitness center, spa, and restaurants. Guestrooms are opulently styled and feature designer furniture, deep bathtubs, HD TV, iPod stereo, and picture windows with views of lush Fort Canning Park. Visit http://www.hfcsingapore.com/ for more information or to make an online booking. Hotel Fort Canning can be contacted by calling (65) 6559 6770 or emailing contact@hfcsingapore.com.